Underpowered: An NTPC plant at Gandhar in Gujarat. All NTPC plants in the country are grappling with fuel shortage. 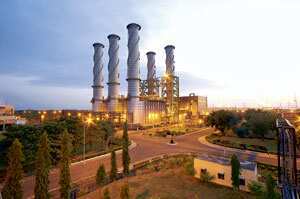 New Delhi: India’s largest power utility, NTPC Ltd, will partner a financial services firm in Nigeria in an attempt to speed up its efforts to secure supplies of gas in the African nation. The company, which urgently needs natural gas for some power plants it is building back home, did not name the partner citing commercial considerations. “Our local partner is a financial institution and it would also take equity stake in the power projects to be set up by us. We have been facing problems there and having a partner that understands the local dynamics will certainly help us," said an NTPC executive who did not wish to be named. NTPC has been actively talking with Nigerian authorities to finalize a contract that would ensure a supply of 3 million tonnes of gas a year for its projects in India. The deal has been delayed after the government changed in that country last year. In return for the gas, NTPC will build a 700MW gas-fired power plant and a 500MW coal-based plant in Nigeria, and renovate a 200MW unit at a 1,320MW plant at Egbin. It will also train around 30 Nigerian engineers and set up a training institute in the country as part of the deal. NTPC is seeking supplies for its seven plants fuelled by gas or liquid fuel with a total capacity of 3,955MW, and its 740MW gas-based plant. All these plants are currently unable to utilize capacity efficiently because fuel shortage. Although there have been several cases of violence against foreign investors in Nigeria, it has remained an attractive destination for Indian oil and gas companies such as ONGC Videsh Ltd or OVL, due to opportunities in its energy sector. NTPC’s total gas requirement is 17 million cubic metres per day, or mcmd, but it can access only 10.5mcmd. To make matters worse, it has been unable to secure liquefied natural gas, or LNG, in the spot market, with prices ranging around $21 per million British thermal units. LNG supply from Nigeria may require an estimated investment of $1.7 billion (Rs7,247 crore). This would include building an LNG liquefaction terminal in Nigeria and a re-gasification terminal in India as gas needs to be transported in liquid form and converted into gas on arrival. The company has cash reserves of around Rs12,000 crore. NTPC has a power generation capacity of 27,404MW, which it plans to increase to 50,000MW by 2012. Of the proposed capacity expansion, coal-based power will account for 15,180MW, while 4,550MW will be gas-based. The balance will be hydropower. India has a gas-based generation capacity of 13,691MW. Of the 78,577MW power that the country aims to add by 2012, 5.45%, or 4,290MW, will be gas-based. NTPC posted a net profit of Rs7,129.3 crore on revenues of Rs37,004.6 crore in 2007-08.